Do you like making any jewelry or accessory for yourself? And do you think is it easy to carry out? Today we are going to learn how to make simple chunky bead necklace within two steps. Trust me, it is truly easy to finish it. I bet you are too impatient to wait one more second, so let us start soon. Firstly, trim off three thin cross chains and ensure they have 25 links lengths. Secondly, trim off the thick cross chain about 40cm length. Thirdly, find the center place of the thick chain and connect the thin chain with the center of the thick center. Fourthly, slide the yellow wood bead onto this thin chain, and attach the other end to the fourth link, as the picture shows. Firstly, attach another thin chain and ensure it is one link away with the first one. Secondly, slide orange wood bead onto it and keep the same length with the yellow bead. Thirdly, place another orange bead onto the other side of yellow bead, and repeat the same step. Finally, connect the two ends of black chain with the lobster claw. Then the chunky bead necklace is done! Unbelievable! We did it, making a simple chunky bead necklace within two steps! So are you planning to have a try? Does turquoise have any special meaning for you, dignity, purity, or any unforgettable memory? And did you try to do something to keep them? 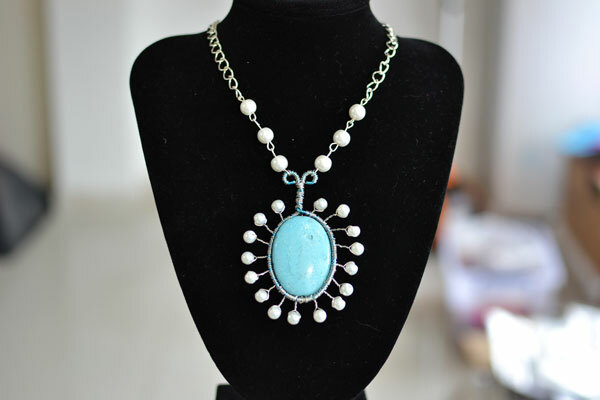 I think turquoise necklace can help you retain those beauties. 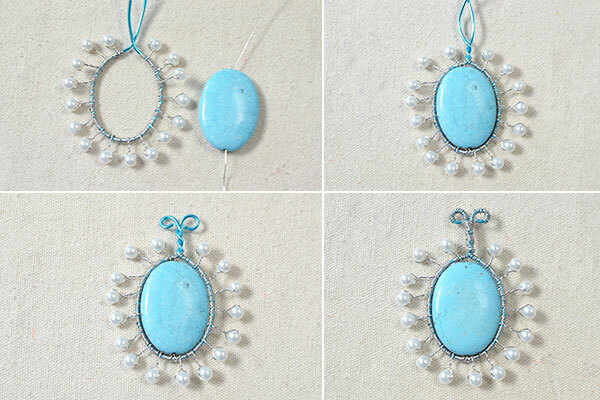 Now I will show you how to make a turquoise pendant necklace. I bet you cannot help following with me. 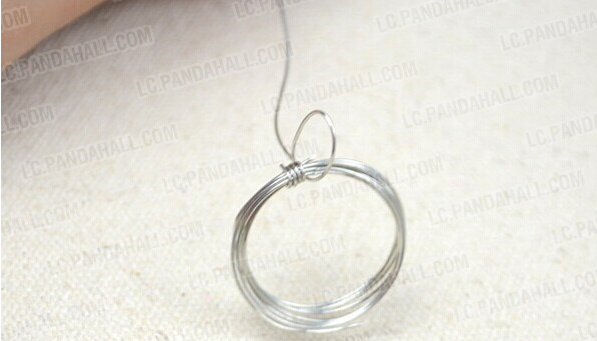 Firstly, cut down the 2mm sky blue aluminum wire with suitable length, then bend it into an oval shape which has a size just as the turquoise bead. Secondly, trim off a piece of 0.3mm sliver copper wire, and slide a 6mm white pearl bead onto it. Then wrap the pearl bead with copper wire as the picture shows. Repeat the trimming, sliding and wrapping until you get desired pearl beads. 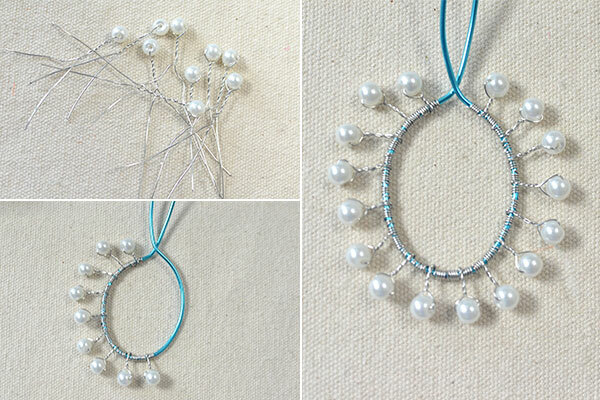 Thirdly, add pearl beads onto the blue copper wire in order, and wrap pearl beads with cooper wire. 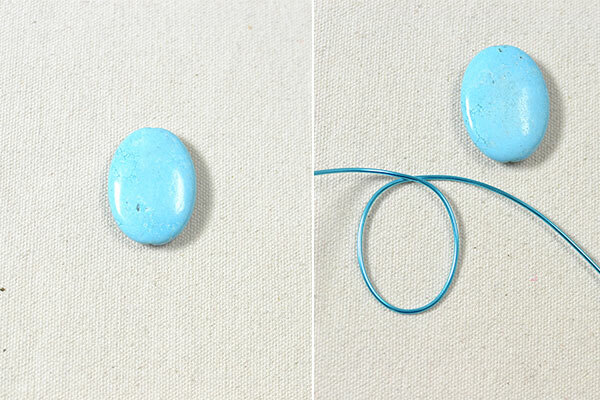 Firstly, cut down a piece of 0.5mm sliver copper wire and slide the turquoise bead onto it. Then put turquoise bead into the middle position of the copper wire, and trim off the excess wire after wrapping the sliver copper wire with blue aluminum wire. Secondly, make loops at two ends of the aluminum wire and then cut down the excess blue aluminum wire. Thirdly, take out some 8mm white pearl beads and slide them onto the sliver eyepins. And connect two beads through warping their eyepins each other. Then add the third one on it like the previous step. It is just connect 3 beads together. 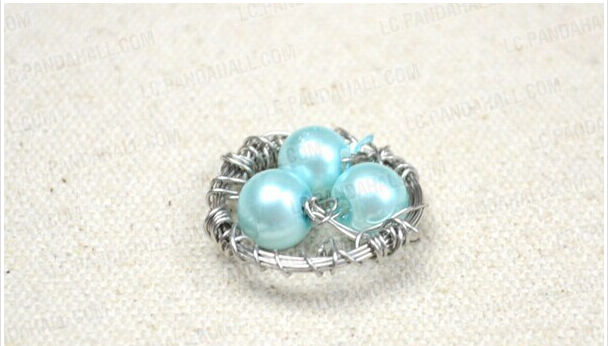 Then you can hang on the pearl beads on the blue loops respectively and fix them well. Fourthly, cut down a suitable length of sliver chain, and connect them with the pearl beads. Finally, use a sliver lobster clasp to combine the two ends of the chain. 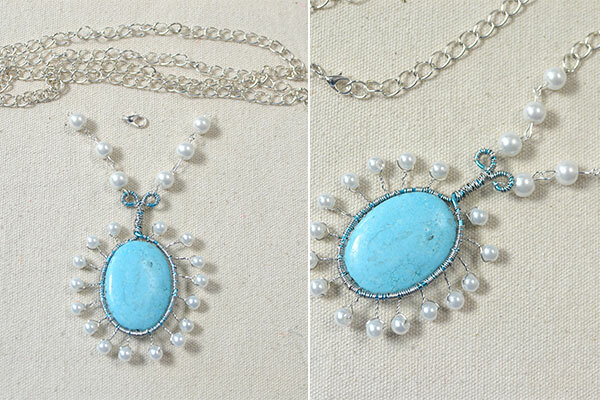 Then it is done, a charming turquoise pendant necklace with pearl bead! 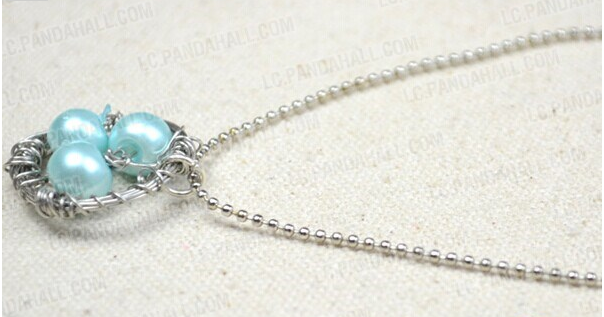 Did you also finish a turquoise pendant necklace? So you must be proud of your DIY turquoise necklace. 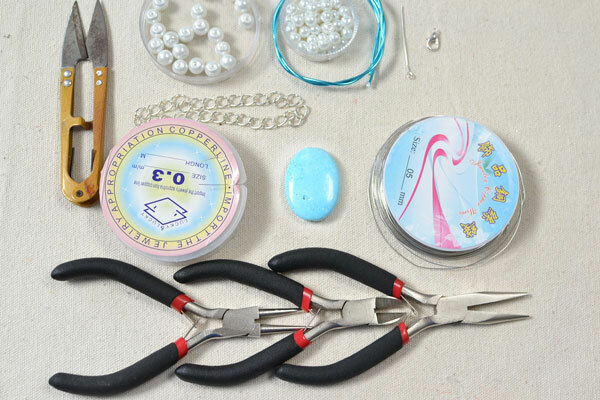 Can you share your craft with us jewelry fans? You can wear it when you attend a party or other not so much formal occasions and it will make you outstanding. Pearl necklace is always popular among the public. And now many jewelry fans tend to DIY different styles of necklaces with pearl beads. And this project will teach you how to make a simple long twisted pearl necklace for beginners. Firstly, trim off the suitable length of copper, and then wrap it for several times to form a circle. Then the nest shape comes into being, just like the picture. Second, let the excess wire wrap around the circle and meanwhile fix them together. Firstly, slide 3 pearl beads onto the copper wire and then wrap them together. Secondly, put the beads in the center of the circle. 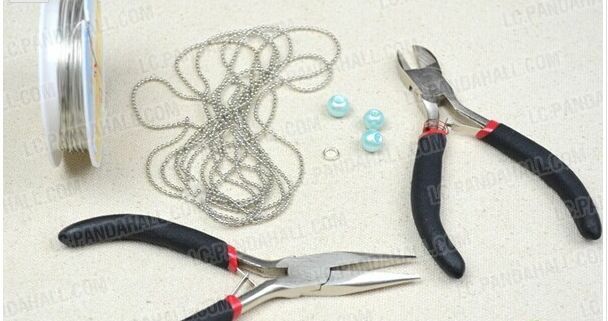 Cut down 10cm length of the chain ball and connect the chains and pearl bead circle with a ball chain connector. Yeah, the long twisted pearl necklace is finished. Is it simple? And you can choose your favorite bead colors or other bead style. So just try and diy something like this.